GhostDash represents an interesting solution to the problems with most traditional lap timers. It's the brainchild of Houston-based company High Rise Garage. The GhostDash crew would like to make driving on a real track a lot more like driving in a sim racer. The idea for GhostDash originated on a forum I participate on, TrackJunkies.org. While most of the forum's focus is on regional track talk, there's a group of users who get together for a sitewide Gran Turismo 5 league. Ghost mode is so good it is almost like cheating! I wish there was such a thing in real life. There is no way to get feedback that good on what is working and what isn't. Put me in ghost mode and I can set a killer lap within 10 laps on a track I have never seen before in a car I don't know how to drive. The limit to the gain from ghost mode is really your imagination and consistency. If you can't do the same thing twice within 2-4 laps there is no way to tell what is working. If you aren't creative enough to come up with numerous different things you will limit your improvements. It's like racing us and getting that instantaneous feedback but with someone going your pace until you make a breakthrough or a mistake. You have to love a mode that gives you instantaneous visual feedback on what is working and what isn't. It's like have a real time data analysis coach that requires no understanding other than whether you are gaining or losing ground. When the admin of the forums chimed in with, "I bet it is technically doable with tech available today. Just need to project a display onto the visor and have a computer that can calculate the ghost car." — an idea was born. I find most lap timers on the market to be a bit distracting. The only real-time feedback many amateur-focused data solutions provide is the time for your last few laps, and depending on where you've mounted the thing, it can be a bit hard to see even that information. The AiM Solo's LCD screen, for example, is pretty hard to glance over at and read because of the lack of contrast. Lap timing apps, too, are a good inexpensive solution, but you can hardly see your lap times because the screens are so small. Problem is, none of the existing solutions provide much in the way of feedback on your fastest laps in real-time. You have to sit down to a computer to download the full data or fumble through an app to get to that vital information. Part of the reason sim racing video games have become such a great learning tool is the full dashboard of real-time data that many sims provide in real-time: G-forces, previous lap times, gaps from your fastest times and mounds of fantastic data that you'd love to have in front of your face when you're driving in real life. Even without a coach to help you dissect recorded lines, throttle inputs and data points, you can see where you're getting pwned by your own ghost lap and adjust what you're doing on the next lap accordingly. This is where Ghost Dash comes in. With trackday safety in mind, the creators of the GhostDash heads-up display wanted to make something, light, secure and transparent that wouldn't obscure your vision on track, shatter or come loose in any way. So, they went with the material of choice for racecar windows everywhere: Lexan. 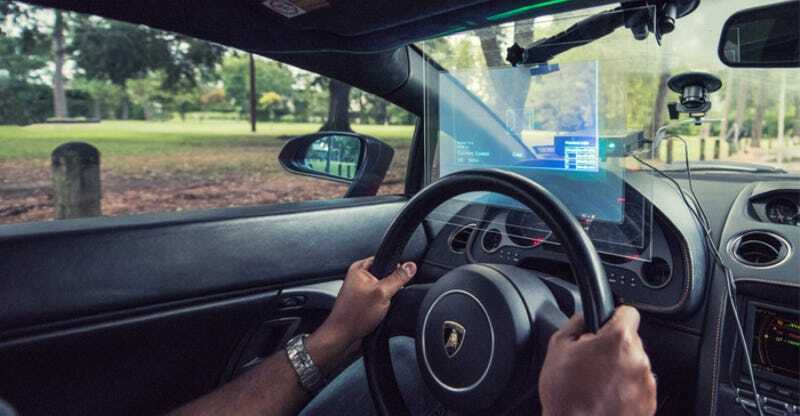 They've partnered with VisLogix to provide a dashboard-sized version of the Vistique HoloFilm to provide a transparent, sunlight-readable projection onto the lightweight Lexan screen. The HoloFilm is embedded in a flexible sheet of Lexan to maintain excellent visibility through the heads-up display. VisLogix is more known for larger screens and brings years of experience perfecting the science of projection to the GhostDash project. The display is 98% transparent and reduces the effects from light sources other than the projector, such as sunlight. The Vistique HoloFilm screen can be installed in multiple configurations—even as a cling affixed directly to the windshield with no adhesives necessary, provided the rake of the windshield is upright enough to work well. The Gallardo in the test video was too steep for this, while something with a more upright windshield like a Miata or my Lancer wouldn't have this problem. If you feel like you might move the system from car to car, you can easily mount it on a standalone sheet of plexiglass. When not in use, you can even roll up the HoloFilm screen for easy storage. The thin dashboard-mounted DLP LED projector is very light at 1.5 lbs and thus, is easy to mount. The GhostDash team went with the smallest and lightest projector they could find that still provided excellent image quality. The projector will go up to 1080P at 30Hz and display as bright as 550 lumens on the brightest setting. A track-oriented GPS unit such as RaceCapture Pro is needed to send GPS data to the heads-up display. The data is sent to a Windows-based device running the software (such as a Surface Pro tablet) and then sent to the projector as an image. If you still want to download your full data set on your laps afterwards, this system makes it easy to use your unit of choice. The Vbox Sport GPS system is currently supported, while RaceCapture Pro and Qstarx GPS will be supported before GhostDash's wide release. Even if you take the safer approach of doing data analysis in the paddock or at home it is distracting to try to remember what you did during the last session to go as fast. On top of that you then have to execute the necessary changes to what you are doing to go even faster. GhostDash allows you to intuitively see what you did to go fast and therefore keeps your mind on the task at hand. It is much easier to mimic or improve upon something you can see than it is to mimic or improve upon something you have to imagine. Press the power button on the projector, and the entire system fires up. After that, the system functions just as it would in a video game, giving you an image of a ghost car when you're behind and an arrow to show where the ghost car is behind you when you're ahead. You get real-time data not just of the ghost car, but of your lap times, your current speed (for those of us in the Broken Speedometer or Non-Stock Tire Size Clubs), and gap in time between you and your ghost car. Since the data is right in your line of sight it is less distracting and dangerous. When I speak to people who use predictive lap timers they tell me they constantly have to glance down during or just after corners to see how what they did affected their time. I noticed I do the same thing when I use one. At 100+ mph or in traffic on track this can be extremely dangerous behavior! GhostDash puts that information in the line of sight while keeping eyes up and on the track. Work until now has focused on adding sector marker support (to divide track times and data into digestible timed segments) and improving the user interface. Plans to add other data points to the GhostDash display and possible future iOS compatibility will be user-guided, with the most requested features coming first. Ultimately, the developers' focus is on the features they think will be most useful to their user base based on feedback and experience. Justin Hayes, for one, comes from a background of club racing and instructing for high performance driver's education programs. That's a good start for knowing what trackday students are going to look for in a data display. The system works extremely well now, after extensive testing. The company claims that they've looked into over twenty different portable projectors as well as five different display technologies before settling on the right combination. Additionally, the software has been extensively tested since March 2014 to ensure that it is as bug-free as possbile before a targeted March 2015 release date. What's left is the initial production run, which the company is hoping to fund through Kickstarter. The campaign for the project is here. $40 gets you a copy of the software itself, where you'd need to provide your own screen, Windows device and GPS system. $1,700 (if you catch the Early Bird level) or $1,900 (after the ten Early Bird packages are sold) will bring you the GhostDash Starter kit, which includes the software, projector and screen. If you already run a supported GPS device and have access to a Windows-based unit, this is the right kit for you. $3,400 (if you catch the Early Bird level) or $3,600 (after the ten Early Bird packages are sold) gets you everything you'd need to run GhostDash in the car: the GPS and Windows devices, the projector and screen, and the software itself. Similar data acquisition systems that put many of the same data points in your field of vision in a track or race car typically sell for three times as much as GhostDash's planned MSRP. OEMs use full windshields for their heads-up displays, which is cost-prohibitive for your average $2K beater track Miata. This also gives you a limited number of OEMs to choose from if you want racing data in a heads-up display. The advantage to the GhostDash is that it can be put into anything. Other products that seek to put this information right in front of your face are dashboards, such as AiM's MXL dashboards, TraqDash and Race Technology's DASH systems. None of those give you the visual of a ghost car, though. There's a whole generation of racers and track geeks searching for faster lap times who have been brought up on video games and sim racers. There are also many gamers who'd love to head out onto a real track someday and put what they've learned in the game to use in a real car. Crossing this digital divide from playing a fun game to gaining useful knowledge is part of what makes things like the Nissan GT Academy so magical to watch. Putting game-style data in front of our face where we can see it safely at speed isn't just a good idea. It's translating vital track stats into a format our generation can read and comprehend.